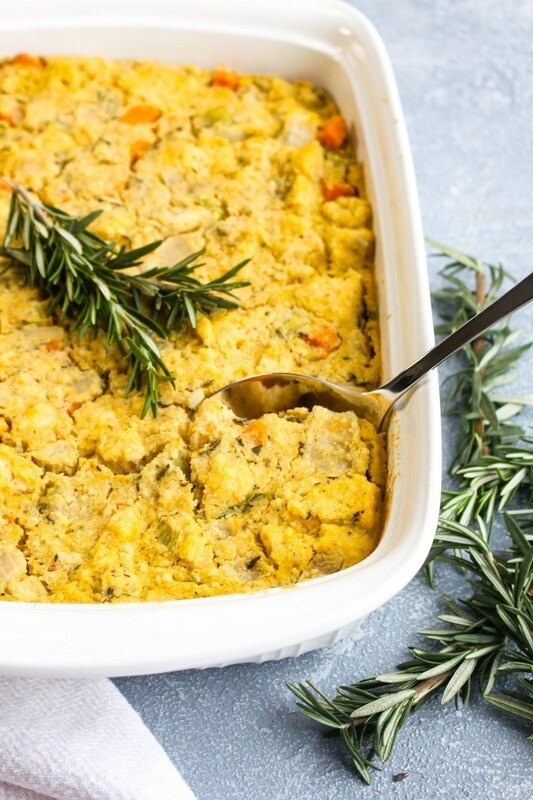 Gluten Free Butternut Squash Cornbread Stuffing is a warm and comforting Thanksgiving side. This easy recipe can even be made days in advance! Bake the cornbread according to the package directions. Once it is cooled, slice the cornbread into cubes and place it in a large bowl. Preheat the oven to 350 degrees and spray a 9x13 inch baking dish with nonstick avocado oil and set aside. Add the butternut squash to a large sauté pan along with 1/2 cup of water. Bring the water to a boil and simmer until it is evaporated and the squash is tender, about 7-10 minutes. Add in the avocado oil, celery, and onion. Sautee until the onion is translucent, about 5-7 minutes. Add in the garlic, herbs, salt and pepper. Sautee for another 1 minute. Remove from the heat and add the vegetable mixture to the cornbread. To the cornbread and vegetable mixture, add in the broth and stir to combine. Pour the mixture into the prepared pan and bake for 60 minutes or until the top is golden brown and the center is not jiggly. Let rest for 10 minutes and serve.